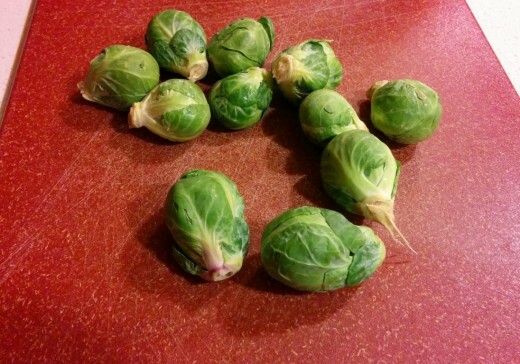 Brussels sprouts have a bad reputation of being the vegetable that everyone hates. I grew up not liking them even though I don’t think I ever tried them. The good thing is I think people are slowly discovering that Brussels sprouts aren’t the awful tasting vegetables they’re made out to be. When I think about the popularity of vegetables, the first thing that comes to my mind is this sketch from Portlandia. One of the marketing team members is struggling to sell celery, while Brussels sprouts and kale are making a comeback and “selling themselves.” Portlandia is such a goofy show, but I love it, and this bit perfectly showcases the show’s unique and witty flavor. Anyways, back to Brussels sprouts. We received some in our CSA last year and I kept an open mind when trying them. I’m glad I did because they are delicious! I think they resemble cabbage and broccoli, and I love slicing them and adding them to salads, along with roasting and grilling them. 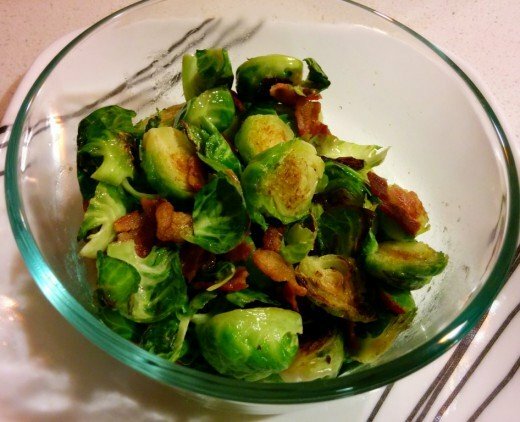 In this recipe, the Brussels sprouts are sautéed in a little butter and garnished with cooked, crumbled bacon. I begin by cooking the bacon with my George Foreman. I’ve been using this method for cooking bacon for a while now and I love it because the grease drains out and the bacon gets very crunchy. You can use whatever method you prefer though. If you like using the stove top to cook bacon, I’d recommend reserving the bacon grease and cooking the Brussels sprouts in the same pan. Just make sure to decrease (or eliminate) the amount of butter you use. 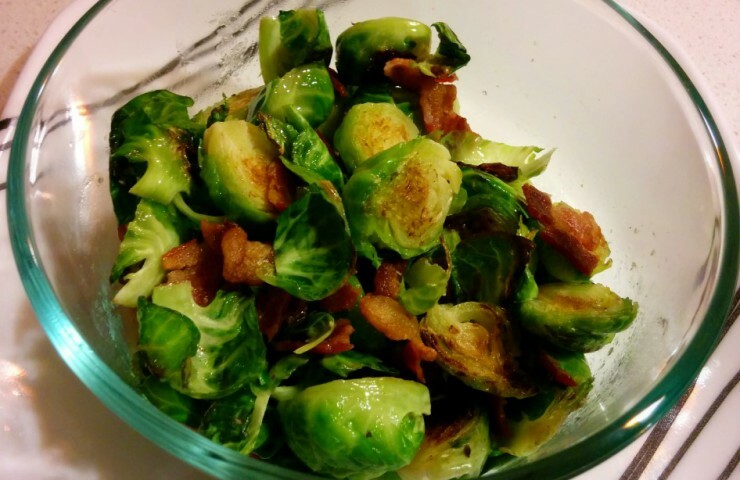 Once the bacon is cooked, wash and dry the Brussels sprouts. 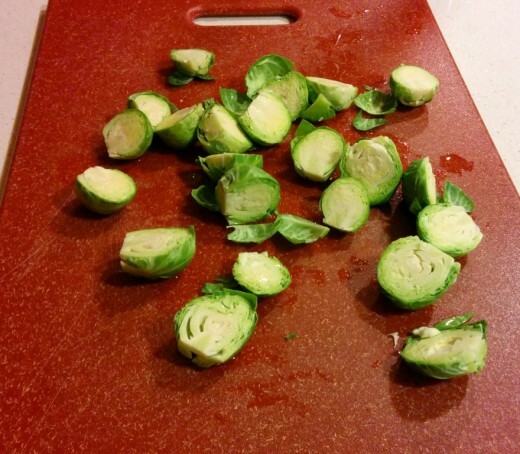 Cut off the stems and slice each Brussels sprout in half. Heat butter in a large skillet over medium heat. 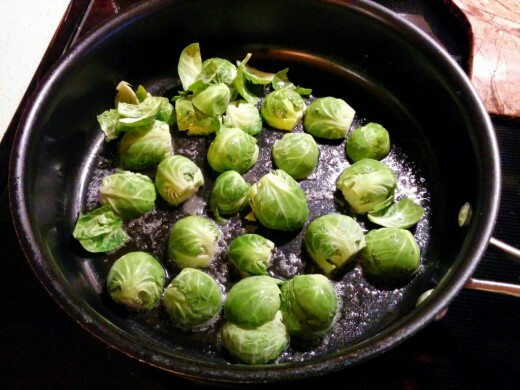 Add Brussels sprouts to the pan face down and cook about 5 to 8 minutes, until lightly browned. Flip the Brussels sprouts over and cook an additional 5-8 minutes until the back sides are browned. Crumble the cooked bacon and add to the Brussels sprouts. Season with salt and pepper to taste and enjoy immediately! Are you a fan of Brussels sprouts? What’s your favorite way to prepare them? Share below in the comments. 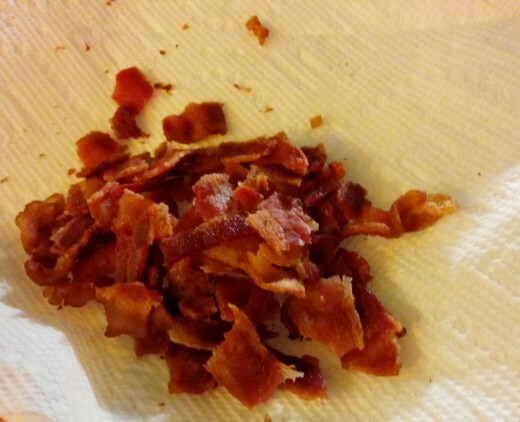 Cook bacon using your preferred cooking method. I like using my George Foreman because the grease drains off and the bacon gets very crunchy. In a large skillet, heat butter over medium heat. Add the Brussels sprouts to the skillet cut side down. Cook until lightly browned, about 5-8 minutes. 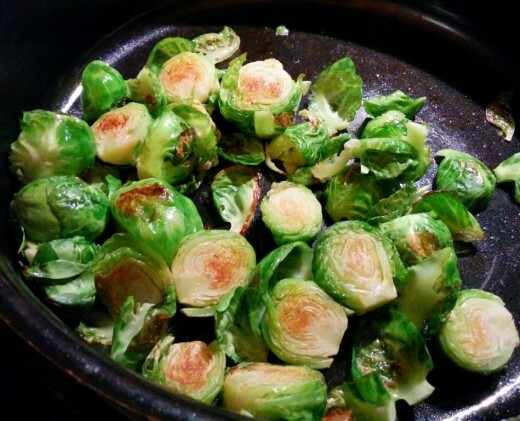 Turn the Brussels sprouts over and cook an additional 5-8 minutes until the back side is browned. Crumble the bacon and add to the Brussels sprouts and serve.